Is InvenSense Inc. Destined for Greatness? Let's see what the numbers say about InvenSense. Investors love stocks that consistently beat the Street without getting ahead of their fundamentals and risking a meltdown. The best stocks offer sustainable market-beating gains, with robust and improving financial metrics that support strong price growth. Does InvenSense (NYSE:INVN) fit the bill? 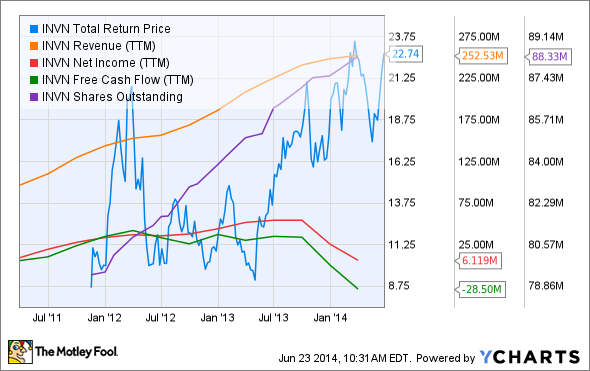 Let's look at what the company's recent results tell us about its potential for future gains. INVN Total Return Price data by YCharts. Source: YCharts. * Period begins at end of Q1 (Apr.) 2011. ^InvenSense financial data begins prior to late-2011 IPO. 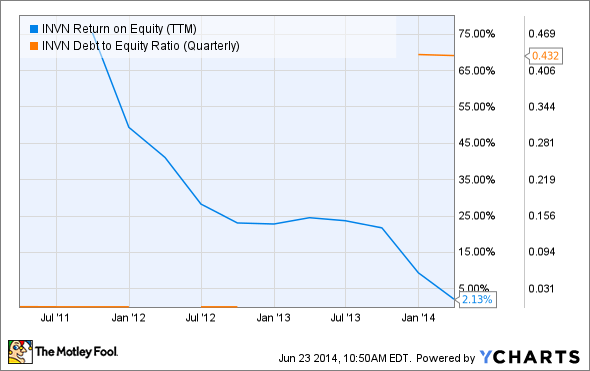 INVN Return on Equity (TTM) data by YCharts. InvenSense has been a hot mobile component play since it went public about two and a half years ago, but the company's fundamentals do not currently support the optimism surrounding its shares, as they resulted in an abysmal one passing grade out of a possible nine. As you can see, InvenSense had been making excellent progress on its bottom-line metrics, which grew far faster than its top line until beginning a multiquarter collapse in late 2013. Is this a sign that investors should flee, or is it simply a temporary issue that InvenSense can overcome to the benefit of its share price? Let's dig deeper to find out. InvenSense's fiscal fourth quarter landed with a resounding thud last month as the company's bottom line continued to contract, a problem driven by overreliance on one key customer (Samsung) and a ramping-up of operating expenses, according to Fool tech specialist Adam Levy. Neither problem has an easy solution, but there are solutions to be found in the problems themselves -- the boost in InvenSense's operating expenses includes a greater marketing push to land placements in other major smartphone makers' devices, and the company also more than doubled research and development spending year over year in an effort to diversify its product lines. InvenSense is already in several major wearable devices, but these devices are probably years from achieving the same level of rapid widespread adoption as smartphones. Its best shot at growth for the time being still lies in persuading other manufacturers to use its hardware and software solutions, and it's going to be hard to convince anyone without spending more on marketing or product development. This marketing push has also led to another round of speculation regarding Apple's (NASDAQ:AAPL) iPhone, as Craig-Hallum anticipates that the world's largest tech company might have put InvenSense's six-axis controller in its upcoming iPhone 6. Analysts have predicted an Apple placement and been wrong before -- it happened to InvenSense just last year with the iPhone 5, according to Fool tech specialist Ashraf Eassa. This is a dangerous game of what if for investors to play, as an inability to find a place in the latest iPhone would crush InvenSense's share price this year just as it did in 2013 when the iPhone 5's components were revealed. Eassa doesn't expect InvenSense to steal a spot from Apple's current partners, but with a heightened focus on product development, we could see InvenSense in next year's Apple products. Adam Levy notes that InvenSense's recent moves, which include hinting at incremental opportunities from a large smartphone manufacturer in earlier earnings calls and building up its six-axis inventory, are possibly signs of an Apple design win. With the iPhone 6 likely to enter production next month, we may only have a few short months before InvenSense investors find out whether the company's recent moves really are due to Apple, or if they're just another head fake as InvenSense's costs continue to spiral into the stratosphere. Today InvenSense has few of the qualities that make up a great stock, but no stock is truly perfect. Digging deeper can help you uncover the answers you need to make a great buy -- or to stay away from a stock that's going nowhere.